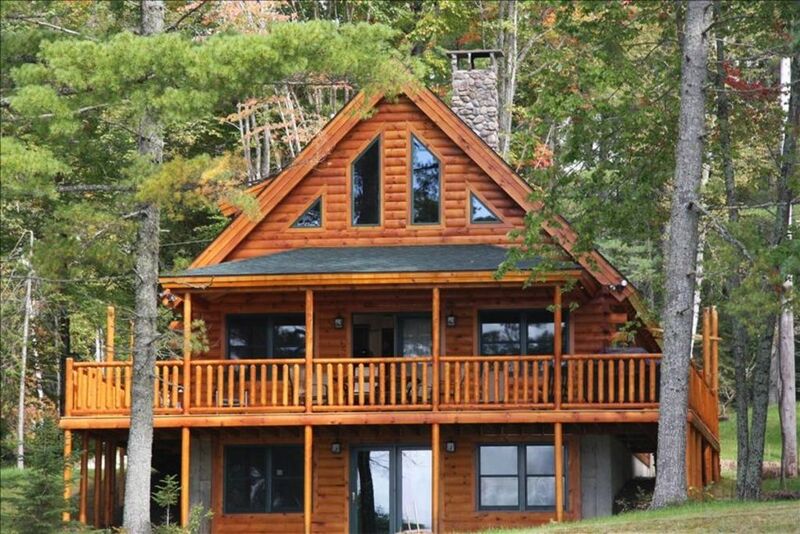 This Gorgeous Log Home was completed in spring of 2011. Enjoy fishing, boating and swimming on beautiful Rangeley Lake. This cabin has 3 bedrooms, 2 baths, fully applianced kitchen, granite counters, hardwood floors, tile in kitchen and baths. It also has a 10 x 22 screened in porch which is perfect to view the sunsets. This cabin is located on a large private spacious lot with a gently sloping lawn right down to the water's edge. A canoe and 2 kayaks are included for your enjoyment. Outside wood fire pit is perfect for evening campfires for cooking smores. A new 6' wide aluminum dock is provided for your boat and much more. Hi I'm a true Mainer, born and raised in Maine. I love the Rangeley area and enjoy fishing Rangeley and the nearby lakes. You will love this unique Log Home which has a large spacious lot and has all the amenities you could ask for. You will especially love the large screened in porch. This is a beautiful, clean, roomy, and well appointed cabin in a great location on the lake. It had EVERYTHING! We had a wonderful time, especially enjoyed the porch, the sunsets, and the rolling lawn down to the lake. Loved the cabin and the location - made for a GREAT vacation! We picked the cabin because it was a cabin on the lake in the mountains - it was EXACTLY as pictured and we loved it. Kitchen was stocked well enough for the light cooking we did and the cabin was close enough to Rangeley (10-15 minutes) and Oquossoc which had a grocery store and several restaurants and was 2 minutes away. The management company had a binder in the cabin that told us great places to eat (we frequented Sarge's in Rangeley a lot - second floor lake view with good food), shop and hike (we did Bald Mountain and the AT to Piazza Rock). The Rangeley IGA had a great selection to stock the fridge too. We took "moose-hunting" drives (listed in the binder) and did actually see one! Also saw a whitetailed deer, turkeys and a red fox. We used the kayaks provided (tons of PFDs provided too) and rented another and a paddleboard one day from a rental place (flier in the magic binder) that was a short paddle away. (River's Edge Sports - this store was great - had souveniors, fishing supplies, kayak and canoe gear and so much more - owners were nice too). Back to the cabin - my favorite things (besides the kayaks) were the hammock and the screened in porch - lots of time spent hanging out here and the porch had a ton of seats. We also fed ducks every morning and night off the dock, and the water was warm enough the neighbors were swimming in it (we didn't). Firepit and firewood provided - we had two fires to make smores and cook hotdogs and enjoy the stars. The setting was SO relaxing - truly one of our best vacations - highly recommend the area and the cabin! We enjoyed our stay at the cabin. It was well appointed and a beautiful lakefront property. The owner was very responsive to our needs-it was an unusually hot week in Maine and he provided us with fans that were not already in the cabin. We enjoyed the kayaks and canoe, and the location was convenient to shopping etc. We loved our stay at this cabin. It is exactly what we were looking for when we searched for a cabin on the lake. It was clean, well stocked, spacious and quiet. We would definitely come back! BEAUTIFUL- A MUST TO STAY HERE! This was our best vacation ever. This cabin is a "must see and must stay" place while vacationing. It is even nicer than the photos that show the property, beautifully decorated! The owner is very helpful and the place is clean. It came with towels, washclothes, handtowels, potholders, bedding, etc.. I would highly recommend this property to anyone. Very quiet and beautiful. I would suggest driving out Rt 16 toward Stratton to see Moose. We seen 10 of them. This cabin is so nice, we did not want to come home. Jackie, Thank you so much for the kind words and comments.